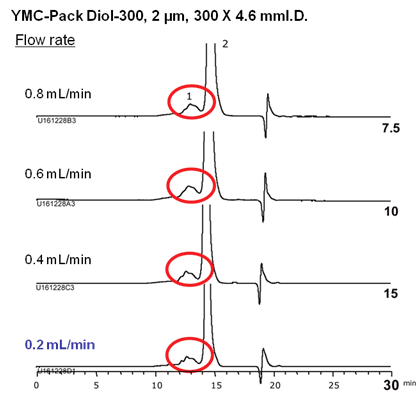 High resolution analysis for monoclonal antibodies and fragments by using YMC-Pack Diol | YMC CO., LTD.
YMC-Pack Diol is a silica gel based size exclusion chromatography (SEC) phase which comes in range of particle sizes and pore sizes for the optimum separation of different biomolecules. Columns packed with 2 µm particles are effective for rapid analysis and high resolution of aggregates and fragments of biopharmaceuticals. 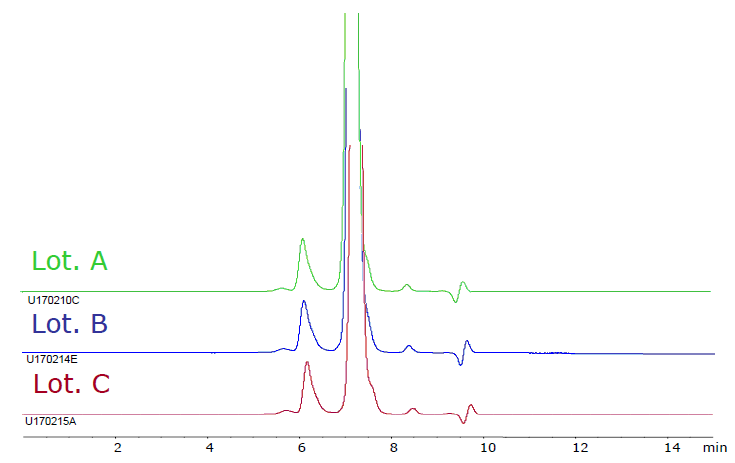 Diol-300 2 µm column was used for monoclonal antibody analysis. Resolution between aggregates and monomer is improved as the flow rate is decreased. Higher flow rates are suitable for increased sample throughput, especially when the resolution is sufficient. The 2 µm, 150 mm length column offers the same resolution as the 5 µm, 300 mm length column. 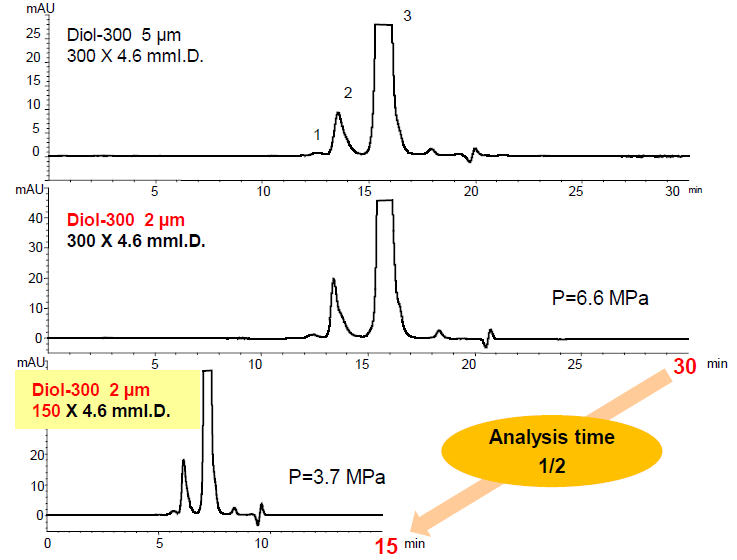 This means the analysis time can be reduced by half by changing the particle size from 5 µm to 2 µm. A monoclonal antibody digested by papain, a proteolytic enzyme, as well as the intact monoclonal antibody were analyzed by using a YMC-Pack Diol-200 column. By using a high resolution 2 µm column, intact antibody and fragments were well separated. YMC-Pack Diol 2 µm columns offer high lot-to-lot separation reproducibility. This feature greatly contributes to characterization of antibodies in areas of research as well as quality control of biopharmaceuticals.